The Municipality of Colle San Magno – WW2 Bronze Medal – opened this museum seventy years after the occupation of its territory by German troops. The museum, funded by the EU, is the visible sign of a community that has not lost its roots. The museum speaks of us: a small village caught in the storm of a worldwide conflict. Our community doesn’t want to forget the atrocities of war; we firmly believe that only through memory can we preserve peace and democracy, and build a better future for the next generations. 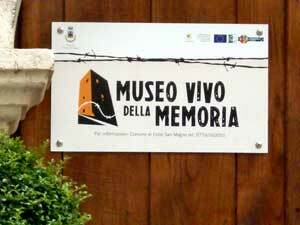 The Museo vivo della memoria, in Colle San Magno, is a museum that narrates the Second World War through the memories and the personal stories of the civilian population. The four battles of Cassino were long and violent. The Allies were blocked for months. Colle San Magno was then occupied by the German army rear. The local population was expelled from their homes or even deported, and was forced to find shelter in the surrounding mountains during the long and harsh winter. The exhibition develops, through six thematic rooms, different perspectives of the major events of the war that took place in that territory between September 1943 and May 1944. With the aid of audio and video contributions, as well as artifacts donated spontaneously by the population, the museum relives the most important stages of the war. Colle San Magno is a small medieval village at the foot of Mount Cairo in the province of Frosinone. Surrounded by oaks and holms, it is an ideal starting point for hiking and horse riding. The small town center is intersected by the Benedictine Way, a beautiful trekking route that leads to the Montecassino Abbey, a 5-hour walk through many important and historic WW2 sites. Opening hours: The Museum reopened on 28 April.